In Oberstdorf, Bavaria, and on the starting line for a four week 600 kilometre hike along the red branch of the Via Alpina. 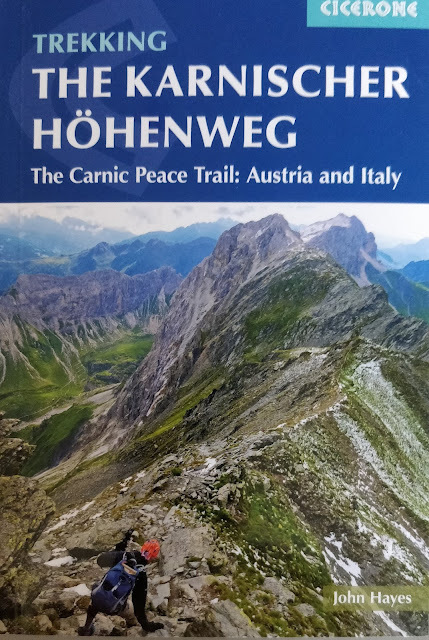 The route takes me east along the German Austrian border, south across Austria and then east again along the border between Italy and Austria. The last part of trip includes the Carnic Way which is supposed to be amazing. It's not alcohol but I feel like I have a bit of a hangover. I was in the Olympic Stadium on Saturday night and I'm still in shock. Watching Mo Farah win the 5,000 metres was the emotional equivalent of being in a washing machine on full spin. That, the slightly surreal feeling in London over the last few days (everyone being so nice to each other), a lack of sleep (very early flight this morning), and sudden arrival in the middle of the Bavarian countryside (I don't speak a word of German), has left me just a bit dis-orientated. Christine, my wife, is partly to blame. She insisted on starting the trip today, the day after the Olympics, but then decided after the Vercors trip, which was definitely a tough one, that she needed another week off walking before hitting the hills again. This has meant getting here on my own which, given my language skills, and general inability to ask anyone the way, is always a bit of an ask. Anyway I got here and without any incident. Easyjet from Gatwick to Munich and a direct train to Oberstdorf - bought the train ticket online and at a discount so feeling very pleased with myself. I'm quite close to last year's Bavarian walk. The train went through Sonthofen, about 20 kilometres to the north of Oberstdorf, a stopover last year. The Maximillianweg took me along the northern edge of the Alps, the last ridge before the plains of Germany, this year I'm right in the middle of the Allgauer Alps and I'm hoping for even more dramatic scenery. Best thing, so far at least, it's not raining. Oberstdorf is a winter sports resort which, at this time of year, is packed with German hikers wearing huge leather boots. Most of them are about my age (various shades of grey) and a few of them are dragging grandchildren up hills. Staying in a hutte tomorrow so I'm hoping to leave the crowds behind. I've had my first German meal of the trip so need a walk.